These questions might make teaching Facing History’s Reconstruction unit – and discussing the sensitive topic of race – seem daunting. In my own experience as a Facing History teacher, I’ve realized that embracing who I am and embracing my surroundings provides me with a unique entry point and lens to engage my students in a thoughtful dialogue about this particular era. As a white teacher who graduated from an urban public school system, I thought carefully about how to approach this topic with an ethnically diverse student body in Boston. My students had experienced racism and other forms of discrimination in subtle ways. They expressed disbelief and shock when reading about African American experiences after the Civil War. I saw this as an opportunity to infuse local history – including the 40th anniversary of the Boston busing decision to desegregate schools. This allowed them to think about the ways that racism and the efforts to overcome it have impacted them even today. I incorporated the voices of others in the community who had experienced the effects of busing while also sharing my own experiences as a Boston student nine years after the decision was implemented. We discussed the questions busing still raises in Boston’s public schools today and how those questions impact their own educational experiences, such as how students are currently assigned to schools. Why can one student who lives one block from a particular elementary school still have to board a bus and travel across the city? 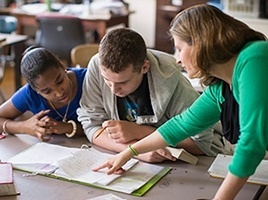 Connecting the legacy of Reconstruction to our own city and experiences helped students think more deeply about race and race relations in Boston and the nation while examining their own identities and experiences. Reflecting back on my career, I know that this approach would look incredibly different in another environment – like in 2002 when I was teaching in Anne Arundel County in Maryland. On one of my first days, the assistant principal asked me if I noticed that some of the black students and some of the white students have the same last name. I admitted I hadn’t. He replied, “That’s because the white families used to own the black families.” Teaching Reconstruction to a student body that bears the legacy of slavery and Reconstruction in their own last names would have presented its own challenges and opportunities. Using the region’s unique history as an entry point into this time period would have guided me to create the most appropriate – and effective – lesson plan. As you consider your own teaching of Facing History’s Reconstruction unit, I encourage you to be bold. Think about the culture of your classroom and assess the level of safety that exists for all students. Take the time to do the foundational work of creating and increasing comfort and safety. Then, think about your student body, and particular town, city or region. How do your students and your location embody the legacy of Reconstruction? Use this as your “in” and your lens. Not only will your students be more engaged in the history, but also they will come away with a sense of purpose, and an understanding of their own responsibility in working to ensure that the promise of American democracy becomes more fully realized as a result of their civic participation. Want to join the conversation? Share your experiences using the hastag, #TeachReconstruction.